Heparin is useful in treating patient with pulmonary embolism, deep vein thrombosis as well as acting as prophylaxis against deep vein thrombosis in patients with acute myocardial infarctions or undergoing surgery. 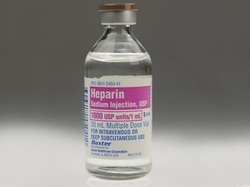 There are few forms of heparin which include low molecular weight heparin or enoxaparin. Heparin will binds to the anti thrombin III which will accelerate the action of anti thrombin III and leads to degrading of several clotting factors / thrombin which are activated. Enoxaparin will usually degrade the activated factor X at a fastest rates than heparin. Enoxaparin has a longer duration of action. Heparin generally has a rapid onset of action and shorter half life. The common sides of heparin may include allergic reaction, heparin induced thrombocytopenia which is related to anti platelet antibodies and bleeding. Protamine sulfate is useful in inactivating heparin to reverse the anti coagulant effects of bleeding.